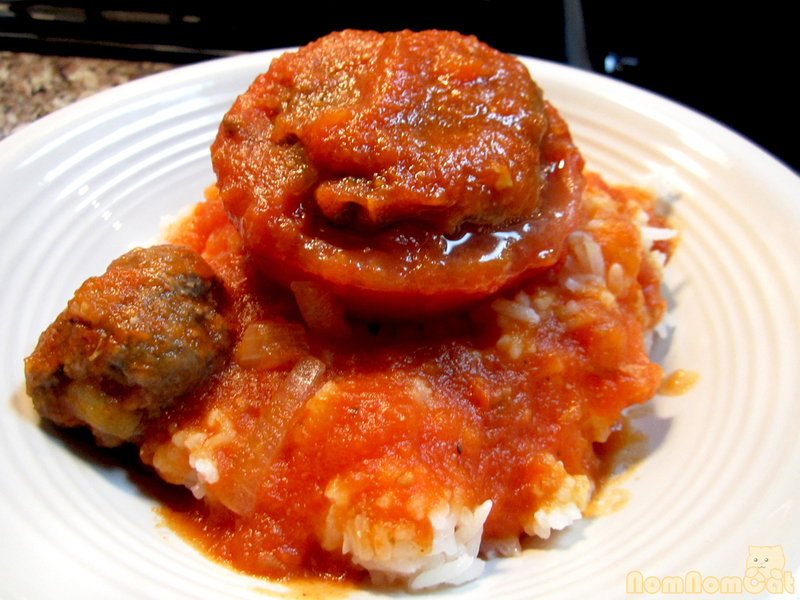 Stuffed tomatoes (cà chua nhồi thịt) is one of Martin’s favorite home-cooked dishes. His mom used to make for him when he was a kid, and it’s a dish that really takes him back to simpler times. So although I don’t particularly crave it, I was definitely motivated to learn how to make it. No Vietnamese mother writes down her recipes and every Vietnamese mother has her own recipe taught to her by her mother and so forth. But between Martin’s mom and my mom, we were able to pull together a hearty meal that’s easy enough to prepare on a weeknight but that also freezes well to keep for later. At home when my mom prepares this for my dad (also a big fan), she includes bean thread noodles (bún tàu) and reconstituted dried wood-ear fungus (nấm mèo). Traditionally, the filling is made with ground pork, but we like the extra heartiness that a simple ground beef stuffing offers (and sadly, it is a bit difficult for us to acquire bun tau and nam meo here on the West Side). We also love our stuffed tomatoes extra saucy, hence the many tomatoes. 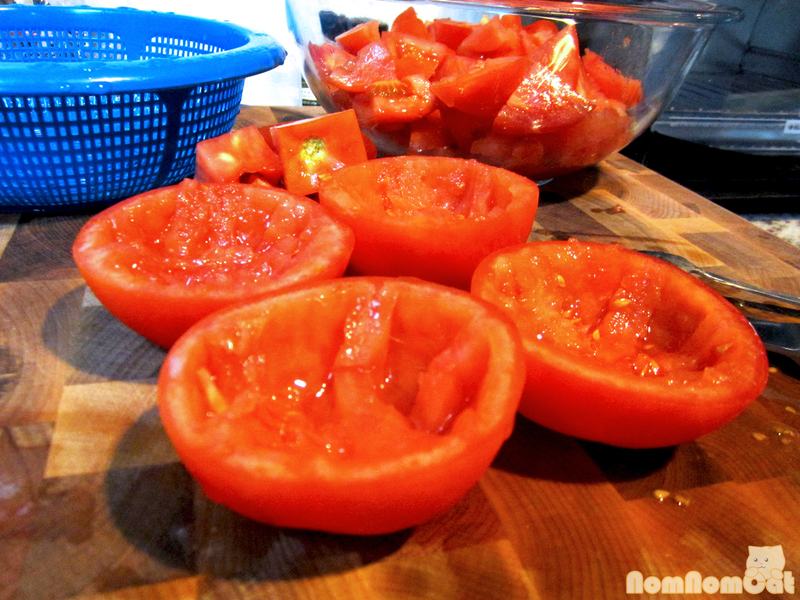 Prep the tomatoes, starting with the pretty halves for stuffing first. 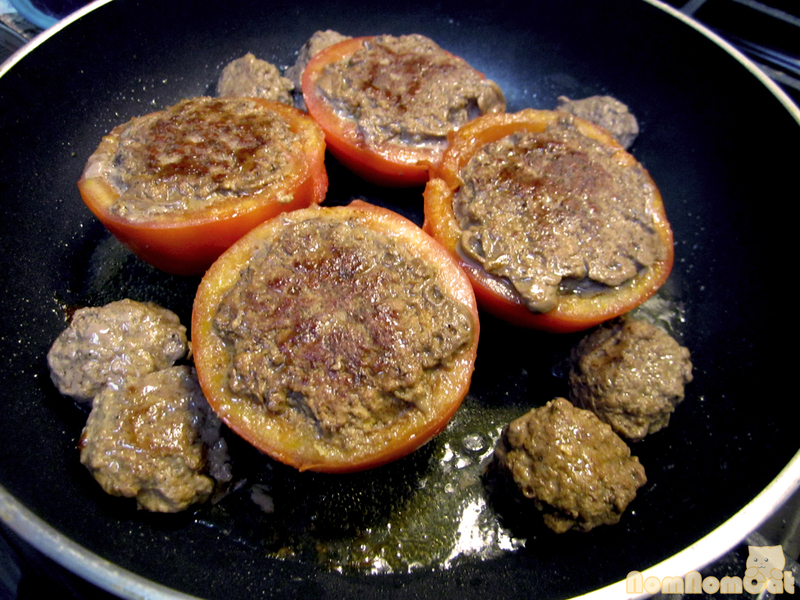 For the prettiest stuffed tomatoes, I use only the “bottoms” of each of the 4 tomatoes. Cut across the tomato (not down through the stem) leaving a little more than half for the bottom side. 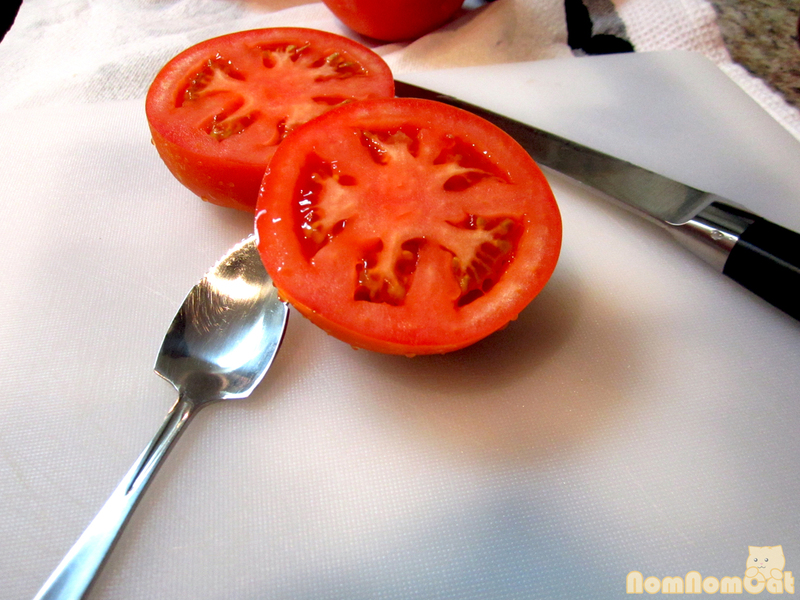 Use a spoon (or even better, a serrated grapefruit spoon) to hollow out the tomato middles; toss these into a small saucepan. Set the ready-to-stuff halves aside. 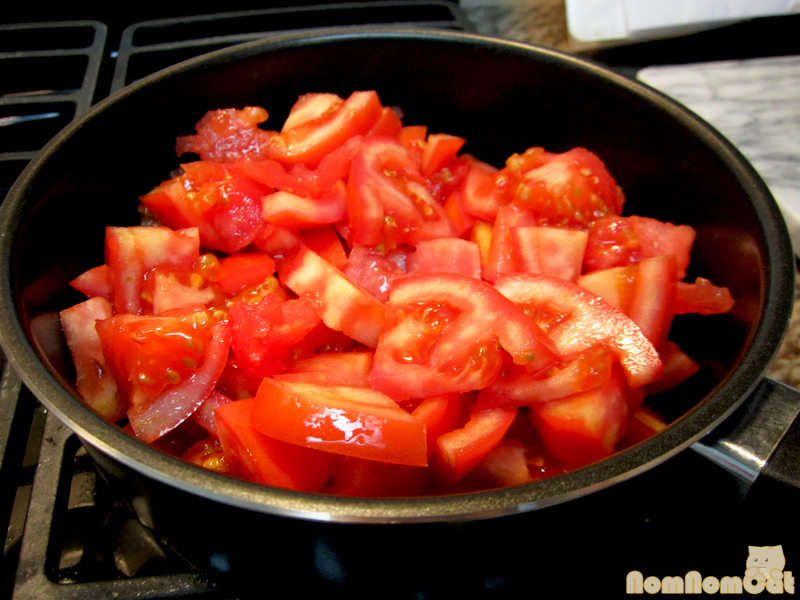 Dice the remaining parts of the tomato (and any additional whole ones you plan to use) into rough chunks – skins, seeds, and all – and add to the saucepan. 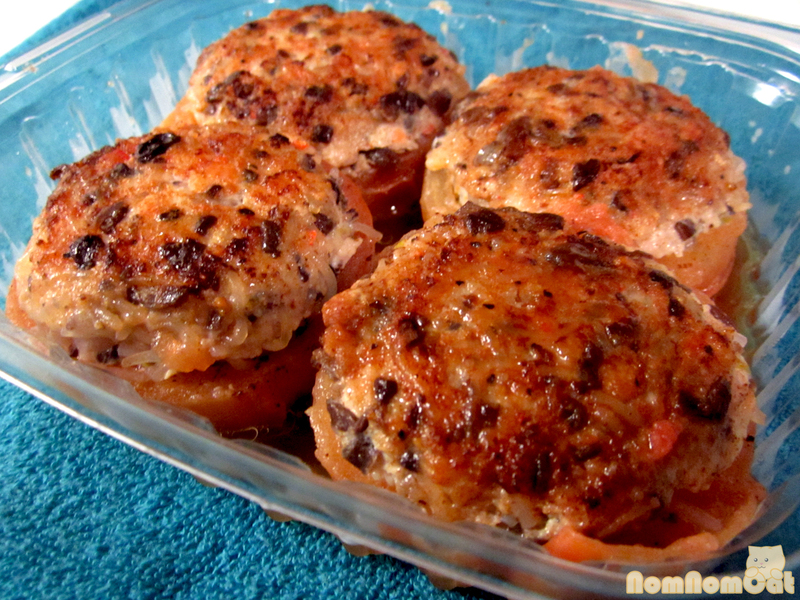 Mix in 1/2 teaspoon garlic salt, 1 teaspoon soy sauce, and 1/2 teaspoon freshly cracked black pepper (adjust to taste). Cook down and simmer on medium to medium-high heat until the tomatoes fall apart. Taste; if too acidic, add about 1 teaspoon of white granulated sugar. 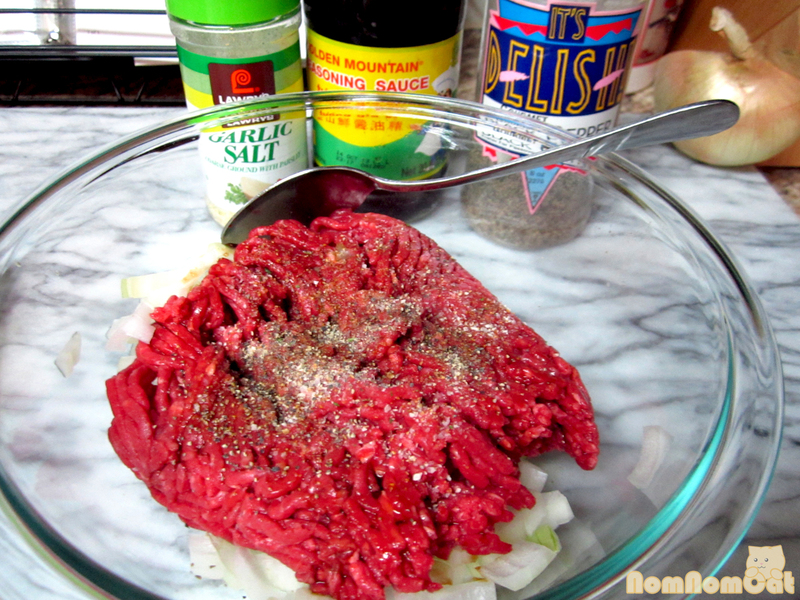 In a small bowl, season the ground beef with the other “set” of the seasonings above – 1/2 to 1 teaspoon garlic salt, 1 to 1 1/2 teaspoons soy sauce, 1/2 teaspoon ground black pepper (this is a good opportunity to use the pre-ground, packaged pepper if you have it sitting around). Obviously it’s not recommended that you taste the raw beef (unless you ground the meat yourself) so try judging the flavor based on smell. Yes, I’m suggesting that you sniff the bowl. If you would like to use onions in your stuffing, mix them in now. We have made this both with and without and they are equally delicious. In a frying pan, heat the oil and saute the garlic until it just starts to brown. 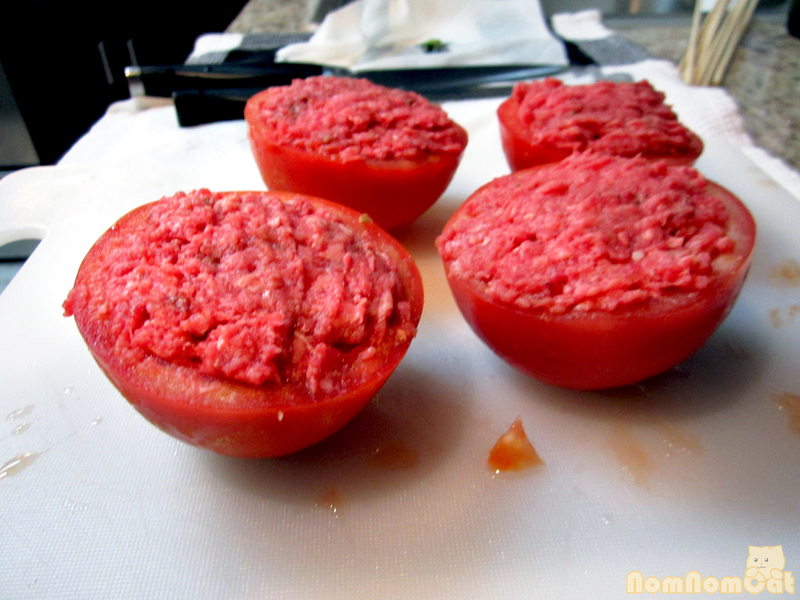 Add your stuffed tomatoes meat-side-down (and meatballs, if preparing) and get a nice sear going. 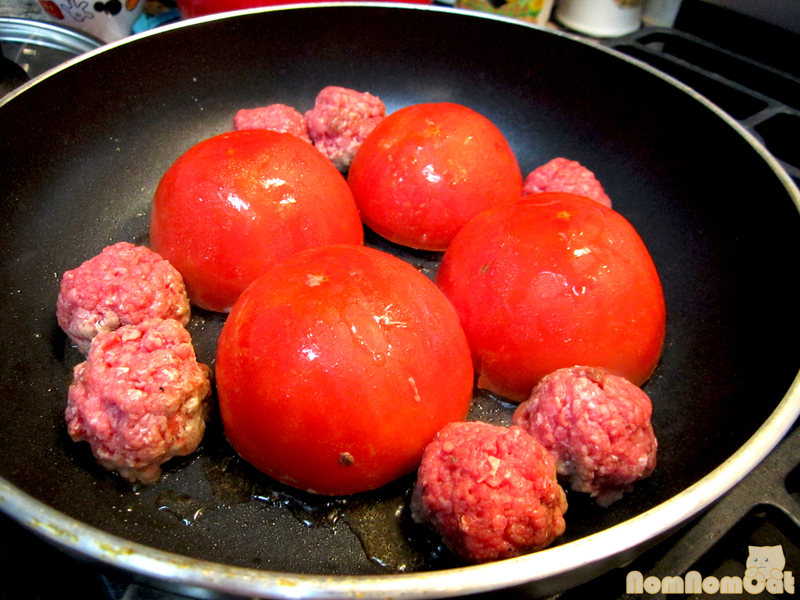 Be sure to rotate the meatballs periodically to get an even sear on all sides. You’ll want to let this go until the bottoms are browned and seared and the meat part feels like it’s firming up. At this point, you could flip them so the tomato side touches the pan. 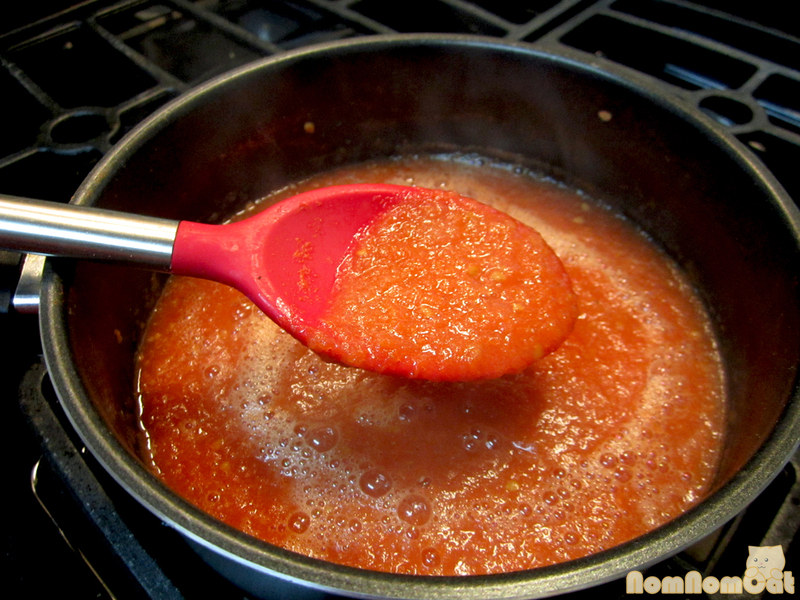 Back to your sauce – are the tomatoes all lovely and cooked down? Good. 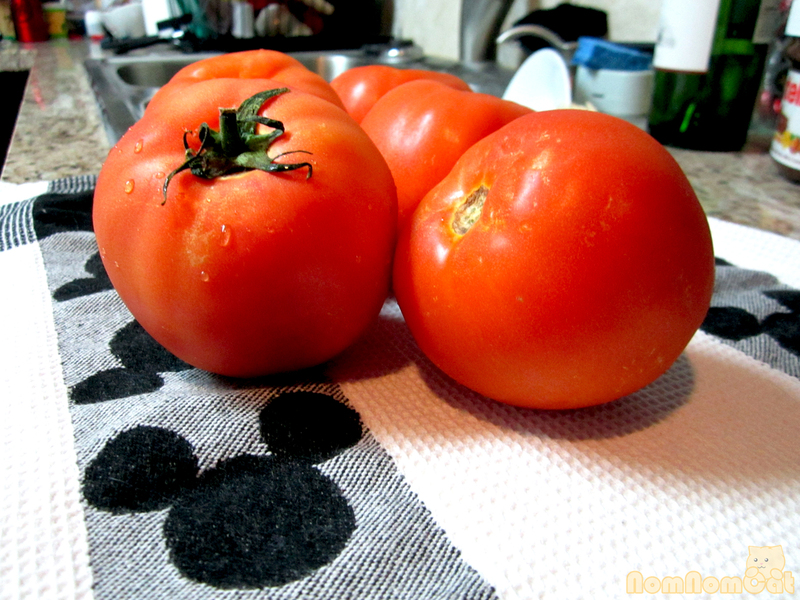 If my tomatoes are a bit bland or acidic, I might mix in a bit of tomato paste to help it along at this point. 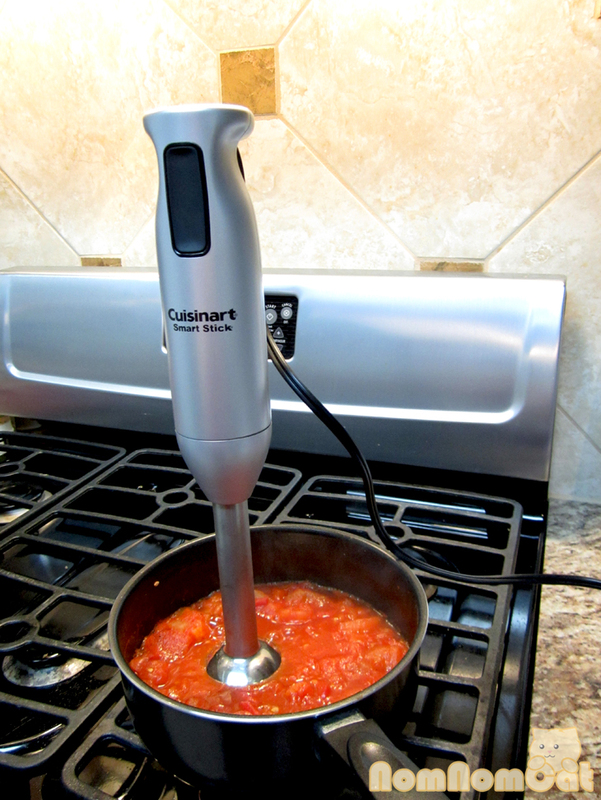 The easiest route to make this sauce more “saucy” is to take an immersion blender and let it whir through the sauce until it’s smooth and thick. 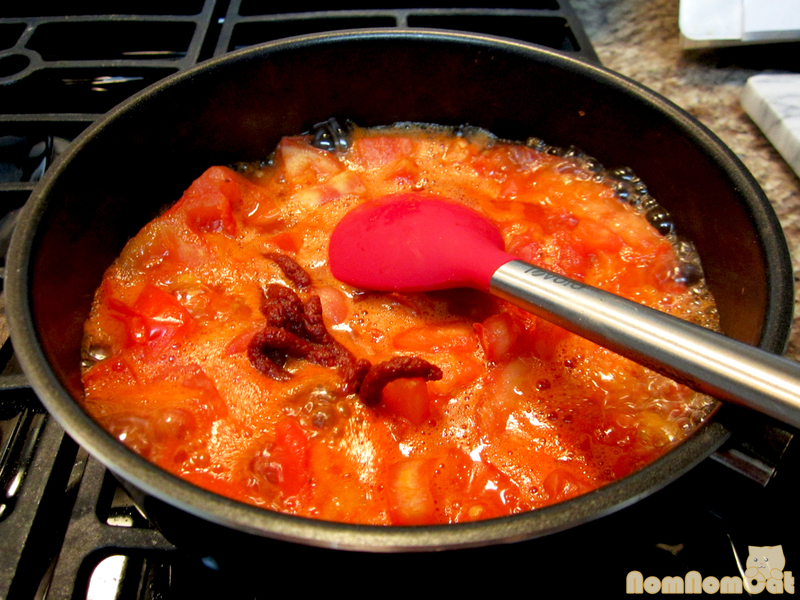 Alternatively you could smash the tomatoes with the back of a spoon and fish out any stray skins that float around. 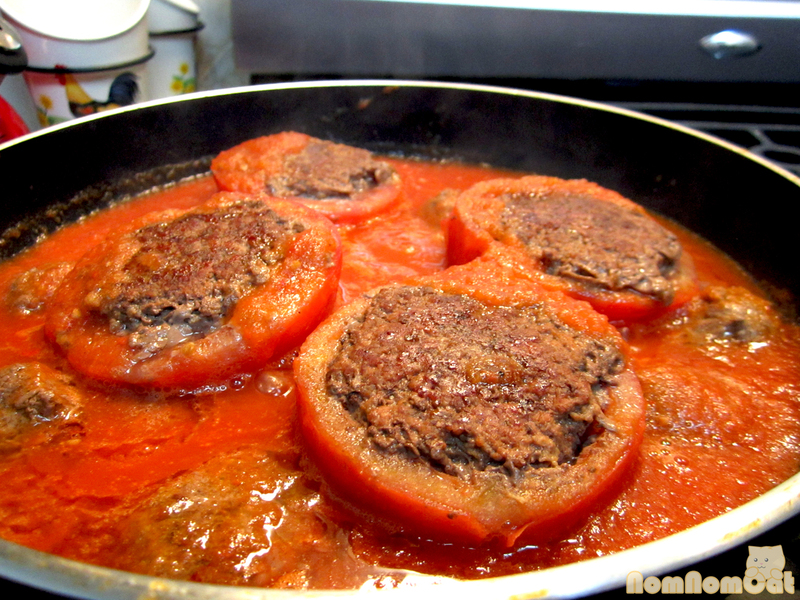 Pour the sauce into the pan with the tomatoes. Continue to cook for another 10 minutes or so to let the flavors meld and to ensure that the beef stuffing has cooked through. Serve over a steaming bowl of white jasmine rice. How ever you decide to prepare stuffed tomatoes, we know it will be a delicious and comforting bowl to warm your heart on a cold winter’s night. The blended sauce was the brainchild of Martin and his mom, established through a phone conversation one evening when I was working late and Martin wanted to surprise me with dinner. He’s quite proud of it and as he should be — it’s velvety and packed with flavor, perfect for mixing into white rice and shoveling down by the spoonful. Enjoy!